Rabbi of Salonica; flourished in the first half of the eighteenth century; contemporary of Solomon Amarillo and Joseph Covo I. According to Azulai ("Shem ha-Gedolim," i. ), Joseph David, "the Saint," was the chief rabbi of Salonica; if so, he must have officiated between Amarillo and Covo. He was the author of: "Bet Dawid," halakic novellæ on the four Ṭurim (Salonica, 1740-46); "Yeḳara de-Shikbe," sermons (ib. 1774); "Ẓemaḥ Dawid," a homiletic commentary on the Pentateuch, with rules for preaching (ib. 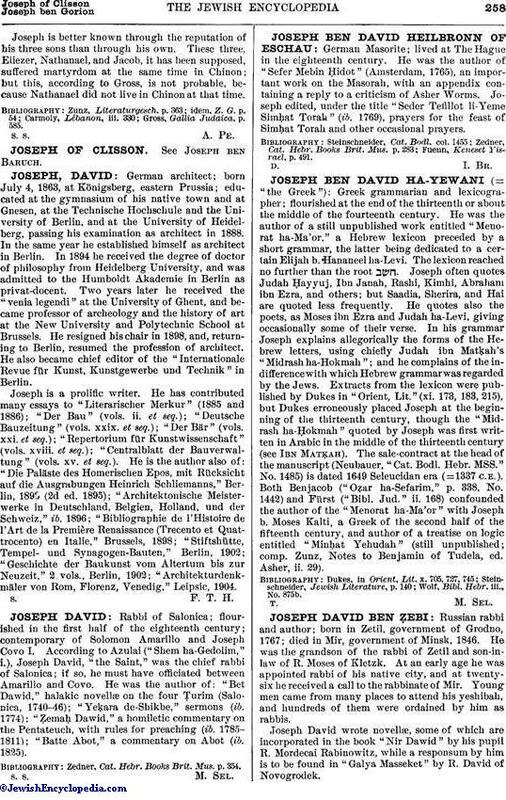 1785-1811); "Batte Abot," a commentary on Abot (ib. 1825). Zedner, Cat. Hebr. Books Brit. Mus. p. 354.